The City of Branson has tough waters to navigate needing to prove contradictory testimony in parallel legal venues as to knowledge and ownership relating to a large portion of the Branson Landing. 2. Attorney Client privilege is waived and sanctions will apply if correspondence between attorneys is not dispatched during discovery. Coverdell's claim was notorius, easily obtainable through the public record. 2. Any contract between the City and Coverdell would require a recorded vote following current law. 3. Attorneys are not legally able to initiate enforceable contracts without a recorded vote. Documents issued in Federal Court remain privileged and cannot be submitted to state courts. Alderman hatched a litigation strategy with Empire District Electric counsel prior to 2004 when the City of Branson sought to acknowledge the Hoke deed and staked it's claim on a small strip of land encompassing half a peninsula.adjacent to North Beach Park. If you have the facts, use the facts. If you have the law, use the law. If you have neither it’s best to hire a Chief Supreme Court Justice. The maneuver is enough to seduce the blindfold off of lady justice. Branson’s hire of Chief Justice John Holstein was a “Hell Mary Pass” placing the city back into a lawsuit they already lost. The reek of special privilege and an unusual imbalance of tolerance forced Coverdell’s team to hire a former Chief Supreme Court Justice of his own. For the slightest infractions Coverdell’s staff has been sanctioned, while Branson seems able to commit the same acts with impunity. As a result of the imbalance two of the most recognized, talented and charismatic attorneys are preparing to argue the Branson Landing Title Dispute before the Missouri Supreme Court. Former Chief Justices Chip Robertson and John Holstein are on opposing sides for the property which may be valued in excess of $100 million. Empire District Electric is notorious for its recent litigation practices on the Lake Taneycomo waterfront.. The implication of its quiet title suit on the Branson Landing’s Northern ⅓ potentially gains the Southern Missouri utility company stronger claim to billions in real estate assets along the waterfront. The utility company is attempting to parlay flooding rights, which serve much like mineral rights, to stronger title. Branson’s public statement following jury trial was that they’d fight the case to the Supreme Court.. Branson wasn’t expecting a win nor planned to follow the Southern District Appellate recommendations. Lack of Supreme Court review never seemed a question. Holstein was hired to escalate the case and until last month he was unmatchedm. Initially rejected by the Missouri Southern Court of Appeals, former Supreme Court Justice John Holstein represented Branson. To the Southern District Appellate Holstein testified Branson doesn’t own any of the property in question, but had judicial standing as a lease holder from Empire and third parties they contracted with as a result of their lease from Empire. Branson’s move allowed several banks , many transactions downstream to stake their claim. With Holstein, the City of Branson won the right to de-escalate the case back to the trial court on behalf of “third parties”. Holstein argued to the Southern District Court of Appeals that the city wasn’t aware of Coverdell’s scope of claim. Speculation over Branson’s awareness is refuted by the City of Branson’s through documents posted in the federal court records Branson Vs. Chicago Title. As Branson initiated parallel litigation, evidence contradicting Holstein’s verbal claims surfaced. Ironically Coverdell’s best claims are documented by the City of Branson itself. The correspondence published elaborate Branson Attorney negotiations and admission of error by Branson City Counsel in early Branson Landing property purchases. Holstein’s use of evidence sent a hidden message to the Southern District legal triumvirate - that a Branson loss would fiscally devastate Branson. During last months proceedings at the Taney County courtroom , honorable Judge McBeth who usually appears the kind, gentle grandparent, - still fascinated with the unique aspects of law . A drastic transition to anger during the last Taney County court session was out of character. McBeth's face grew bright red as he scolded Coverdell's lead counselor with an allogory of the desert beaver. According to McBeth, the desert beaver is an animal with slaps the dust to create a smokescreen for escape. ****Authors Note: With respect to the honorable Judge McBeth; I have spent much of my life exploring the deserts of the Western United States and have never seen a desert beaver. After hearing of this obscure animal myth/legend Research left me wanting as there is no such animal taxonomized. The beaver is an aquatic loving mammal and evades deserts at all cost. The judges usually collected demeanor shifted to a sharp scolding as he foreshadowed events to come. "I'm not having attorneys deposed ", shot McBeth. Deposition of attorneys is key to Coverdell as documents recently released by the City of Branson reveal appellate arguments were proveably unrepresentative of fact. As new parties enter the case an incestous pool of attorneys switch sides billing banks, municipalities and utility companies. City Documents released in the federal case provide a window to negotiations critical to Coverdell's claims. Documents published by the City of Branson in federal court essentially prove Coverdell's case. Unfortunately for Coverdell, the documents were drafted by attorneys and are being shielded from review. . The documents move from proving ascertains contrary to those verbally issued to the Missouri Southern District appellate court. Two former Chief Missouri Supreme Court Justices will battle this week over an ownership dispute on Branson's largest commercial development. The lawsuit originates from Empire District Electric's challenge encompassing a grid of land atop a third of the Branson Landing - controversial among Missourian's. for it's classification as a Super TIF (Tax Increment Financed). A surprise appellate win granted the City of Branson, a chance to intervene. A quiet title suit brought by Empire District Electric question land ownership relating to a third of the tax funded lake front project on the shore of Lake Taneycomo. The lawsuit was derived from backroom negotiations between the City of Branson and Empire District Electric as the City of Branson partnered with HCW to create the $450 million lakefront outdoor mall. The feature is a revenue generating engine funding the Branson Hilton Convention Center. Much of the Branson Landing's partnership agreement sits on Empire District Electric property rented to Branson through a 99 year lease. If the contest is over reaping billable hours and increasing clients to bill , Lynn Rogers scores top dog. Rogers first represented the city of Branson where he handled negotiations between Peter Rea and Coverdell, then skipped to First America Title, Bank of America and has recently landed with Jim Walton managed Arvest Bank. According to legend and Taney County trial courtroom lore, the peninsula had a dual meaning the phallic shape and the owner were both known acknowledged in the double entendre "Peter's Point". During the 1970's Peter Rae was known to patrol Peter's Point preaching, Bible in hand, to youngsters who found the wooded area an ideal makeout spot. Rea is best known for his role as Taney County Circuit Judge enacting unorthodox practices before he was derobbed.. Correspondence published by the City of Branson in their federal lawsuit against Chicago Title notes Springfield Attorney Lynn Rodgers mediated negotiations between the City of Branson and Peter Rea. Branson City Officials proposed terms of a land purchase which apparently broke down. Rodgers language begins with notable errors in Branson's land purchases and settlement transitioning to harsher language - even going so far as to cite sexual misconduct as an element of him being disbarred. After a Taney County jury verdict granted Branson Paper - et Coverdell sole ownership of the property Branson City Officials hired former Missouri Chief Justice John Holstein and used press resources to publicize the land dispute would be heading to the Supreme Court. The issue was taken by the Missouri Southern District Court of Appeals who initially rejected Branson's right to press the case due to their voluntary withdrawal. The conditions of Branson qualifying for an appeal are seen by the legal community as precedent setting exceptions incited by special privilege honoring the status of Holstein as opposed to sound application of legal cannon. The appellate overruled the Taney County jury verdict permitting third parties from entering the case. These third parties are subject to Empire's claim granted to the City of Branson and then contracted from the City of Branson and the HCW Development. The Southern District Appellate opened the door for several banks to enter the proceedings. Instead of completing negotiations, Branson City Leaders placed a plat map over the property in litigation and proceeded to seek public funding - investment solicitation alleged the property was insured and not currently in litigation.. Under normal circumstances the banks would push for prosecution, an unprofitable move at this point because of the deep investment and risk of losing money - whether fraud was committed or not. 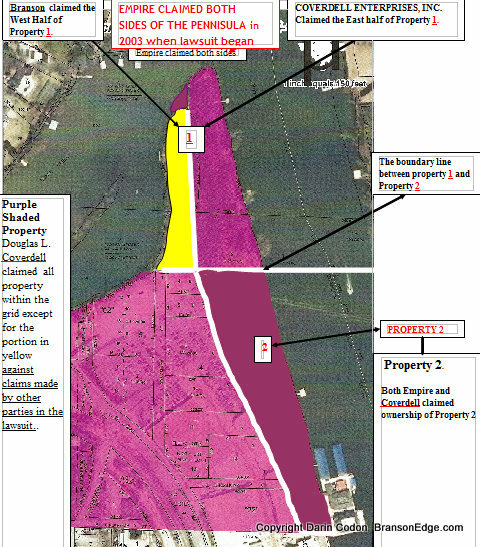 The last proceedings involved legal action on behalf of Coverdell who claimed the dispute with Branson Paper resulted in an agreement in 2004 when the land was bifurcated and the City of Branson's written correspondence reverting their initial claim they they owned the entire grid and settling with Coverdell for half of the peninsula - half the shaft on Peter's point. Coverdell cites correspondence on the public record where he is threatened by the overseeing judge who states, "If you have an agreement you need to sign this now Mr. Coverdell. ". Coverdell notes the enforceability confirmed by the judges statement. Judge McBeth’s demeanor was lightened by Chip Robertson who earned chuckles from the 17 attorneys which crowded the courtroom last month as appeals appear imminent. McBeth noted that Cocherham's request for Summary Judgement for the original trial findings would result in his being overturned - something he hoped to avoid. Branson Officials continue to raise the legal tab and are likely to earn a minor victory on May 29th porous enough to demand further judicial review..